No where has there ever been a fishing video series of this magnitude with so many professionals working together to deliver the best education possible. This is fishing reality on steriods as the anglers share their practive days and in cases like B.A.S.S., FLW and others, a finite number of days called official practive, which are the only days they can be on the water before the event. These videos are unscripted and unrehearsed, and you will see no double takes or staged highlights. The anglers are their own hosts with insights provided by Tim Horton and others, you will see a different side of the anglers, a share all video format you've never seen before. Includes 3 discs with Tim Horton, Brian Snowden, Pete Ponds, and Boyd Duckett on Wheeler Lake and Harris Chain of Lakes. Includes 2 discs with Zell Rowland, Jami Fralick, Jason Quinn, Matt Reed, Terry Scroggins, Ben Parker on Pickwick Lake and St. Johns River. Includes 2 discs with Jeff Kriet, Mike McClelland, Derek Remitz, Shaw Grigsby, and Paul Elias on Toledo Bend Reservoir and West Point Lake. 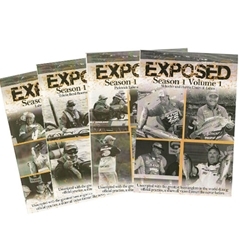 Includes 3 discs with Aaron Martens, Gerald Swindle, Matt Herren, Kevin Short, Peter Thliveros, and Mark Menendez on Lake Murray, and Arkansas River.